Apparently somebody has been listening to my belly aching about watching indoor baseball and decided to test my mettle. 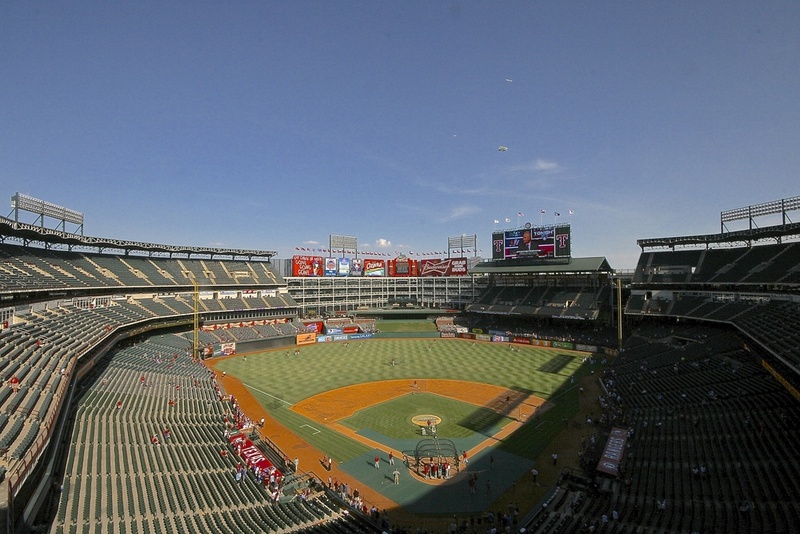 Today was a hot one in Arlington, Texas. I spent 11 hours at Rangers Ballpark beginning with a tour of the stadium, ending with a magnificent fireworks show with pretty good baseball game squeezed in between. I have not done many official stadium tours on my trip thus far. Being in each city for such a short amount of time does not allow for a lot of flexibility in my schedule. 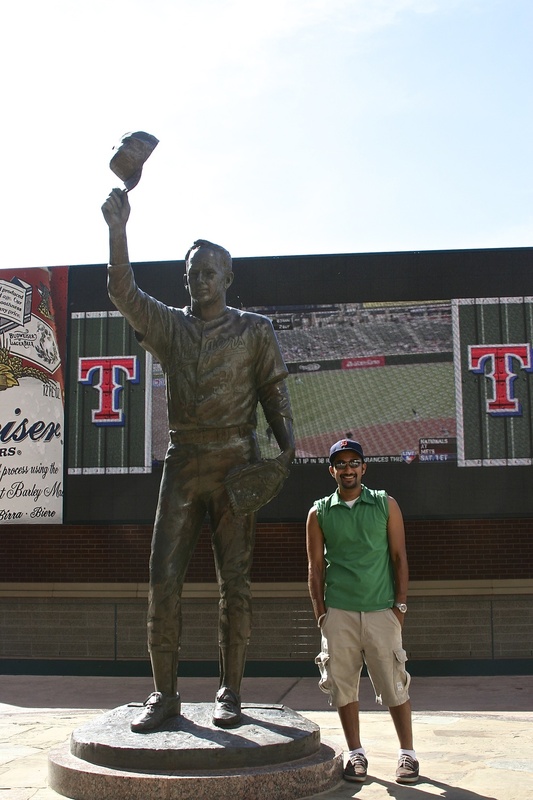 After touring the Rangers Ballpark in Arlington I think I may start trying to make time to do this at every stop. 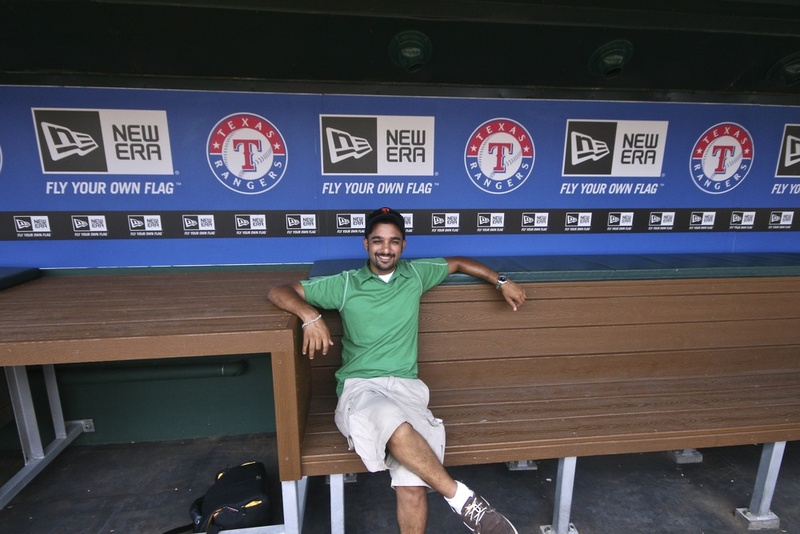 Most of these tours include a trip to the luxury suites and the press box which is nice; but the real reason to shell out a little extra money at the ballpark is the chance to grab some pine in a major league dugout. You can check out more of the photos from the stadium tour above in the photo gallery. Not only does this tour include some great information about the ballpark itself, but hanging out in the dugout and the post-game media room lends itself to some great photo opportunities. I met some great people as we explored the stadium, including an amazing trio of women that included three generations of Rangers fans (pictured right). I spoke to the granddaughter for the podcast. If you have not done so yet, head on over to iTunes and subscribe to the podcast so you can hear the adorable Laney talk about her love for the Rangers and baseball. I had some time to kill and with the weather officially topping triple digits for the first time on my journey, I took this opportunity to find someplace cool to retreat to. I ran some errands and found excuses to hang out inside some stores that had their air conditioning blasting. I bought some replacement camera equipment and with nothing else pressing went to a local Best Buy to sit in their comfy chairs and watch some high definition nature in their home theater department. Finally it was time to head back to the stadium for some live baseball. This really is a great place to watch a baseball game. With my beloved Tiger Stadium no more, I was happy to see that the famed right field overhang has made it's way to Texas. Looking out towards right field gave me happy flashbacks to watching games in Detroit during my younger days. 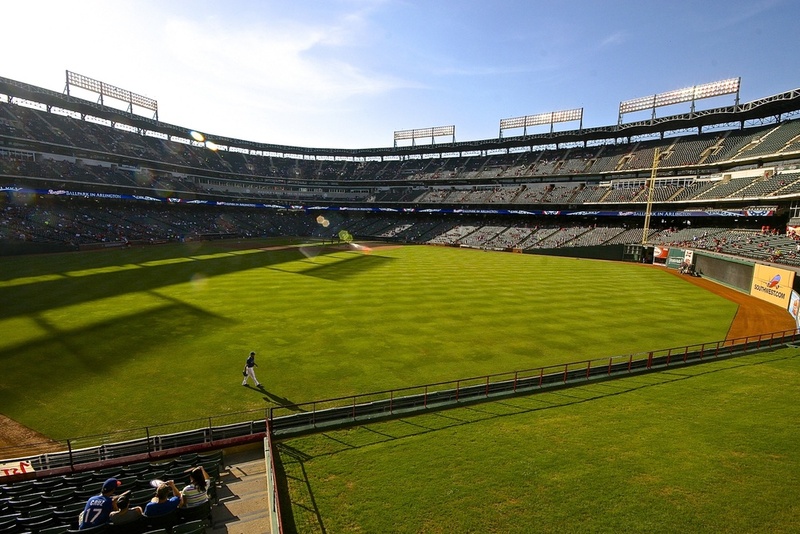 In addition, the Rangers have allowed their fans to hop the barricade in straight away center to grab any home run balls launched 400 feet onto the grassy hill. 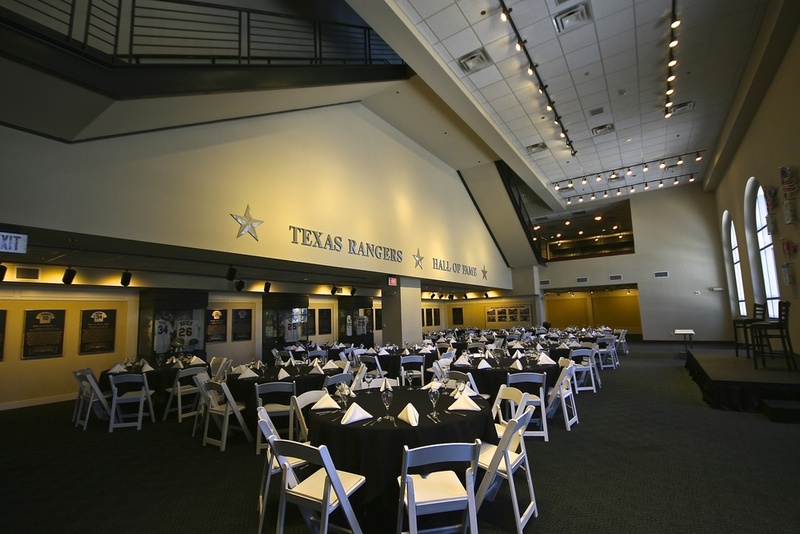 The Rangers have done a tremendous job of blending the old with the new creating a very special place for fans to catch a ballgame. Of course, the food was something that I was anticipating/dreading. “Everything is bigger in Texas” kept playing over and over in my mind as I approached the food stands. For those of you wondering, no I did not get the Boomstick. I am sorry for disappointing you, but I am a small man and this two-foot long hot dog drowning in chili, nacho cheese, jalapenos and caramelized onions is nearly half the size of my entire body. I did however eat a Nolan Ryan burger which was nearly as large. Have officially given up on trying to stay healthy this summer. This burger was ridiculous. Not only is everything bigger here, this was the best burger I have ever had at a baseball stadium. First pitch time was approaching fast with no reprieve from the sun. My seats were on the third base side behind the visitor's dugout. 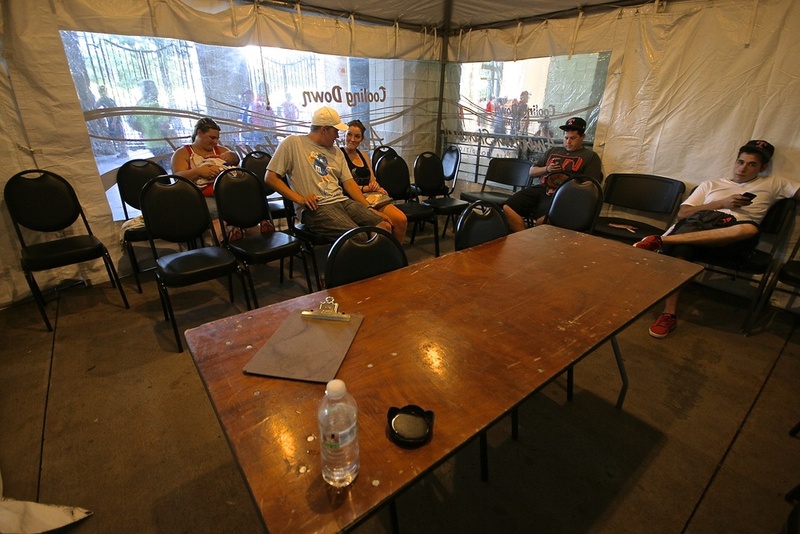 Earlier in the day on the tour I learned that in order to maintain home field advantage, the architects of the stadium made sure that the visitor's dugout was the last area to receive shade. Good for the Rangers, bad for me. I found my way to the air conditioned tent for a minute or two before heading down to my seats. I finally feel like I am watching summer baseball and it is glorious in it's hot and sticky splendor. 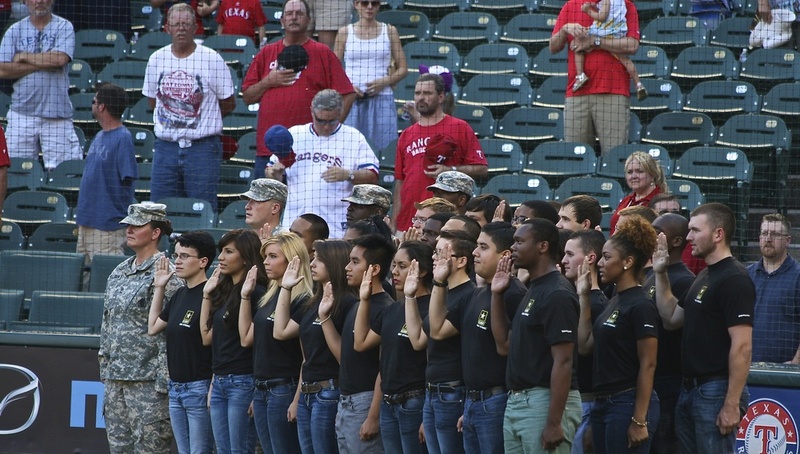 After the first pitches were thrown the crowd was treated to witnessing a young group of recruits take their Oath of Enlistment right on the field. I have not mentioned it yet, but the work that Major League Baseball does with the United States Armed Forces is tremendous. There are active and retired troops honored at virtually every game and discounts given to Military personnel throughout the ballpark. It truly never gets old to see a Veteran throw out the first pitch or even see him/her on the scoreboard with their families. This was yet another Interleague game on my schedule as the Cincinnati Reds were in town. As Reds pitcher Johnny Cueto took the mound I had a flashback to watching Game 1 of the 2012 NLDS during which Cueto exited the game after throwing only eight pitches. In today's game he made it to 29 pitches before leaving the game with an injury. 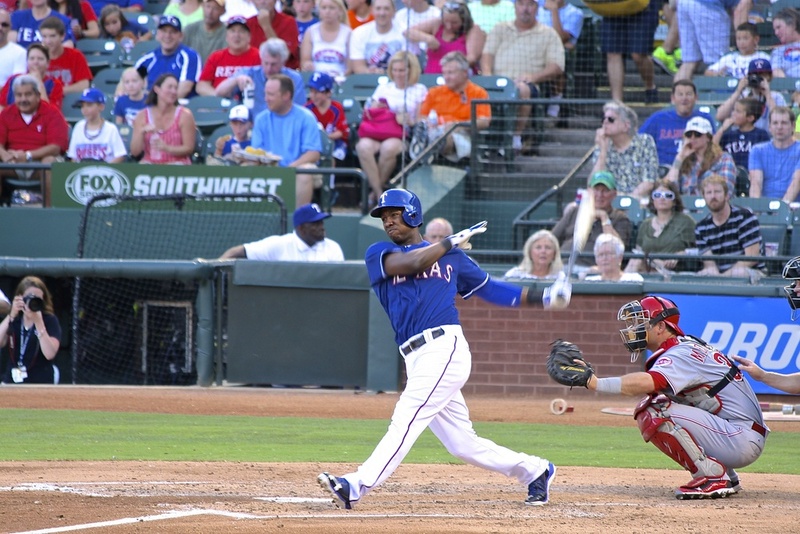 After losing their Ace pitcher in the second inning, the Reds were no match for the Rangers. In fact, Rangers young hurler Martin Perez threw six and two thirds of shut-out baseball before turning the game over to his bullpen. 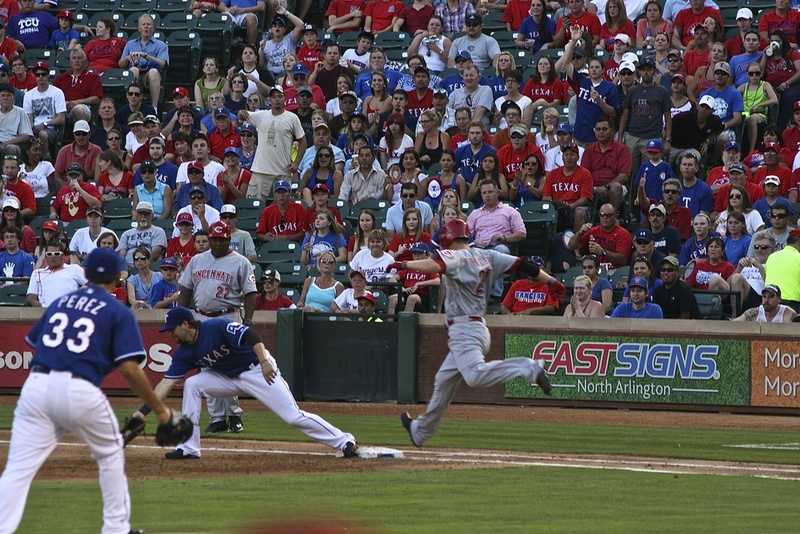 The Reds would out-hit the Rangers, but were unable to cross home plate over the nine-inning affair. 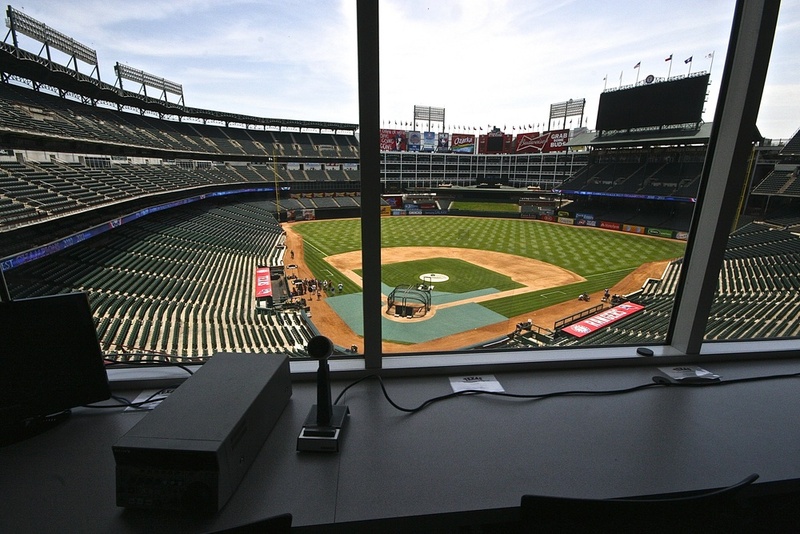 The game was rather uneventful with Reds reliever Tony Cingrani walking in two runs and giving up a single to Rangers rookie phenom Jurickson Profar in the fifth. It was a low scoring day at the ballpark with a lot of great pitching. There is a debate that I get into with baseball fans and non-baseball fans alike. Which do you prefer: A pitcher's duel or a slugfest? Let me know what you think at roundingthirdpodcast@gmail.com or tweet me @RoundingThirdMJ. As with every game I have attended thus far, I had some fun seatmates sitting around me. The conversations that I have been having during every game have been enlightening as to how the different fan bases treat the game of baseball and their individual franchises. 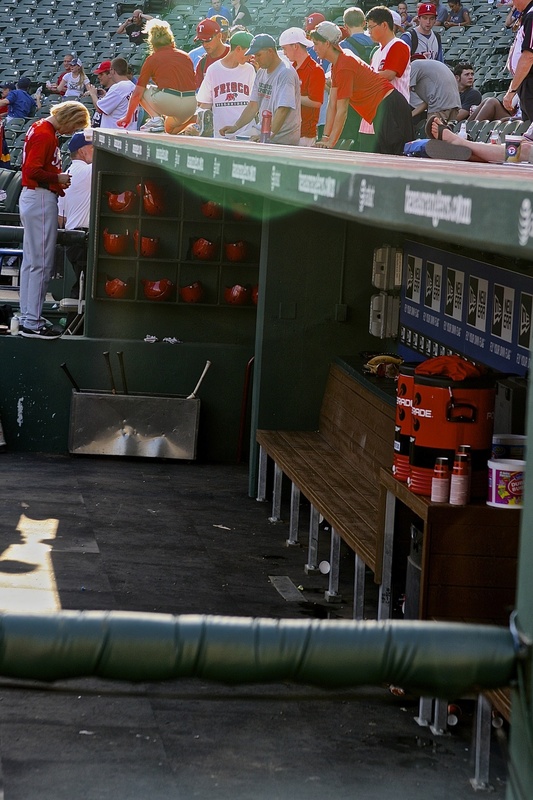 The Josh Hamilton drama of the summer has reinvigorated this city. Hamilton unknowingly lit a fire under the collective backsides of Dallas as now they openly consider themselves a “Baseball Town” with the infamous phrase lighting up the scoreboard in between innings. After the heartbreak of the 2011 World Series and the disappointment of the 2012 post-season these fans are ready to explode. After the game the crowd was treated to one of the best fireworks shows I have ever seen at a ballpark. It was long, it was spectacular and it was unique. The fireworks exploded from different parts of the stadium, illuminating different sections of the crowd with choreographed bursts of light. Sadly my July 4th will be sans baseball, but this show was a fine substitute for an Independence Day extravaganza. Today was a fantastic day of history, baseball and fireworks. 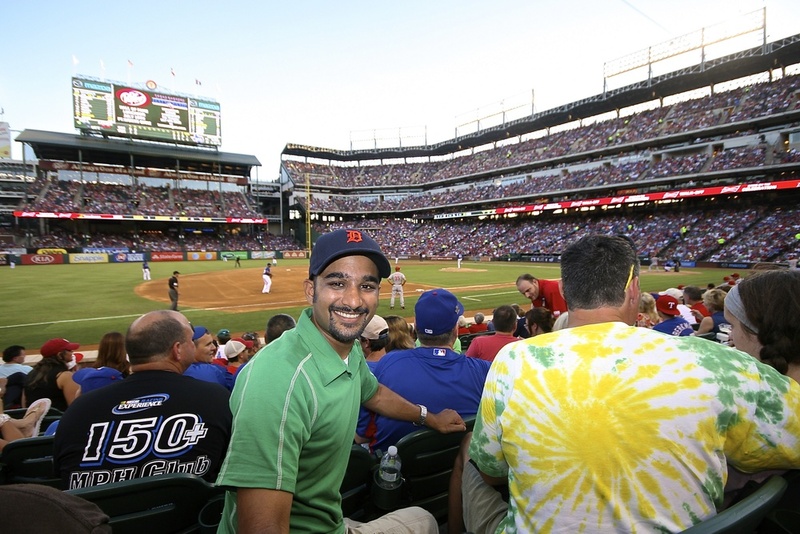 Rangers Ballpark in Arlington is a great place to catch a game. Once the sun went down, the evening turned into the perfect night to sit back and watch some professional athletes perform at the highest level. 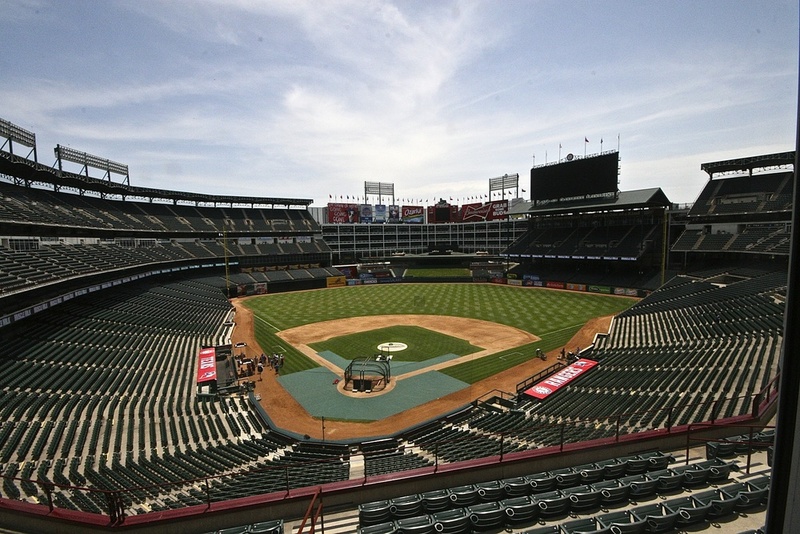 If you are ever near Arlington in your travels, I highly recommend catching a game at this ballpark. If nothing else, you will be able to feed your family for a week on the food they prepare.